prospecting that ensured significant, measurable results? Most companies may have already missed their goal and don’t even know it! How do you determine which prospects to reach out to first? Are there prospects who are more likely to close than others? 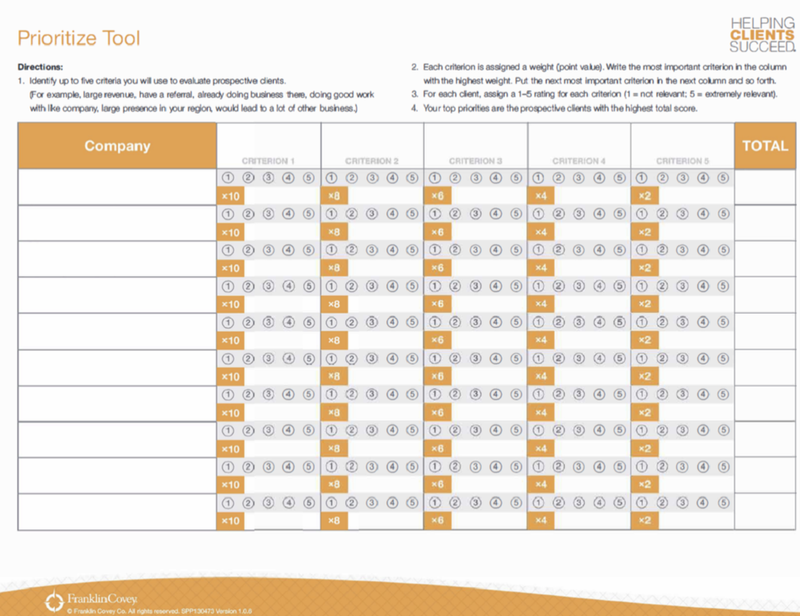 The Prioritise Tool from FranklinCovey's award-winning sales training - Helping Clients Succeed: Filling Your Pipeline - helps sales leaders and teams use their time and resources more effectively by rank ordering prospects based on pre-determined criteria that indicate which ones are most likely to become customers. Start prioritising your contact strategy today with this awesome tool. A new approach to prospecting with an immediate, measurable return on investment.